Marines at the Sunday game ask fans to donate to the Toys for Tots drive. Photo via Chargers twitter. 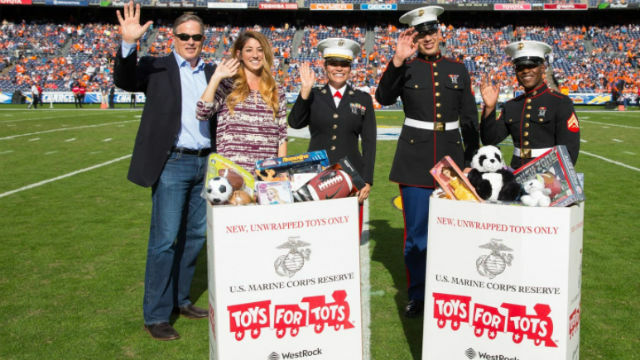 The 27th annual San Diego Chargers Toys for Tots toy drive will be conducted at Sunday’s game against the Tampa Bay Buccaneers, with members of the U.S. Marine Corps accepting new unwrapped toys at white collection boxes located throughout Qualcomm Stadium’s inner ring parking lot. Marines will also be walking through the outer lots, collecting cash donations. Three Chargers will wear custom cleats reflecting their support of causes as part of the NFL‘s My Cause, My Cleats campaign, the culmination of 18 months of collaborative work between the league and players, according to the league. Linebacker Melvin Ingram will wear cleats in support of his Mission Possible Foundation which provides inner-city and low-income children with educational opportunities and resources. Linebacker Joshua Perry will wear cleats in support of Autism Speaks, the world’s leading autism science and advocacy organization. Safety Darrell Stuckey II will wear cleats in support of the Fellowship of Christian Athletes, an interdenominational Christian sports ministry. 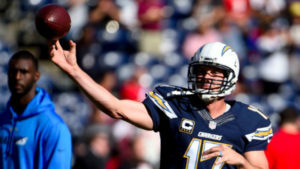 Philip Rivers warming up for the Charger’s Sunday game. Courtesy of San Diego Chargers Twitter. Linebacker Jerry Attaochu (Glory’s Hope Sickle Cell Foundation), nose tackle Brandon Mebane (childhood literacy) and cornerback Jason Verrett (Kaiser Permanente) had planned to wear cleats in support of causes but were placed on the reserve-injured list because of various injuries. Some of the cleats will be auctioned at NFL Auction, with all the funds being donated to the charities selected by the players. U.S. Marine Corps Sgt. Maj. Jorge Melendez will be honored at the Salute to Service Moment. Melendez is the sergeant major of Marine Wing Support Squadron 373, Marine Aircraft Group 16 and Third Marine Aircraft Wing based at Marine Corps Air Station Miramar. He enlisted in 1994 and has been deployed to Iraq, Afghanistan, Kuwait, Djibouti, Jordan, Bahrain and Japan. Melendez’s awards include the Bronze Star with Combat Distinguishing Device, Meritorious Service Medal, Navy and Marine Corps Commendation Medal, Navy and Marine Corps Achievement Medal, and the Combat Action Ribbon. Pregame activities will include the final round of the NFL Punt, Pass & Kick local competition. Girls ages 7-15 will perform on the field at halftime as members of the Junior Charger Girls.